Tropical Smoothie Receives a "Signage Facelift" in Orlando! 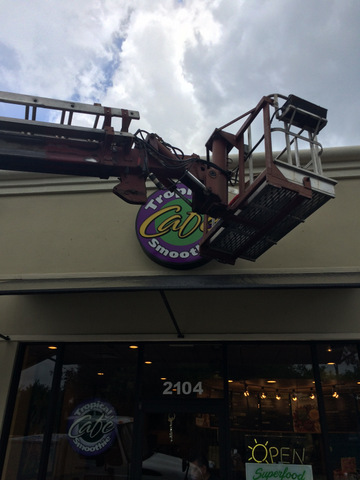 Tropical Smoothie Receives a “Signage Facelift” in Orlando! Your signs say a lot about your business. If your exterior building sign is faded, cracked, or tattered, it will tell potential clients that you do not pay attention to details and that you probably will not provide them with quality products or services. 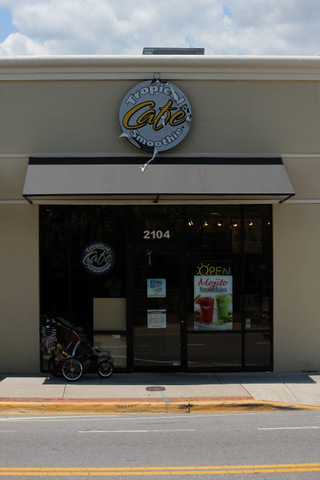 Tropical Smoothie Café realized this, so they contacted Citrus Sign Studio for sign maintenance and repair in Orlando, FL. 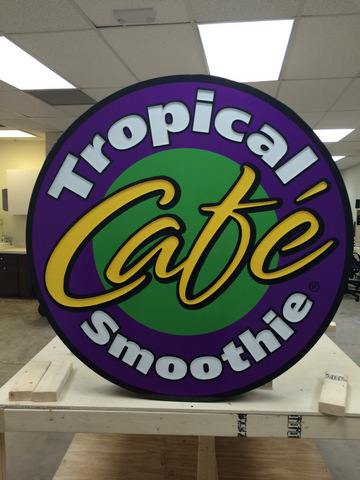 A fresh new cabinet sign for Tropical Smoothie! 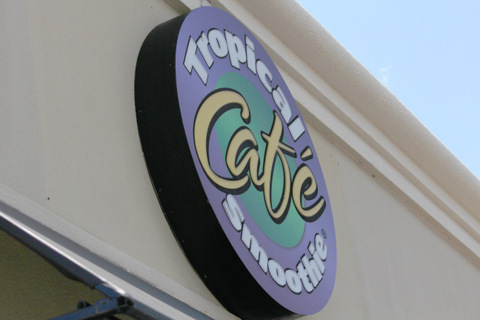 Tropical Smoothie has come a long way, since they first opened a fresh fruit smoothie stand on a Florida beach. These days, they have more than 300 locations in 30 states. They aim to produce healthy, flavorful food and smoothies made from fresh ingredients at an affordable price. In addition to smoothies, they offer flatbreads, toasted wraps, gourmet salads, and sandwiches. Another cool feature of their cafes is the fun atmosphere they nurture. Their old sign needed a lot of work! When a business that is seeking to offer Americans healthy food alternatives came to us for sign refurbishing and repair in Orlando, FL, we were more than happy to help. We were contacted by the owner of the Edgewater Drive location because their front exterior building sign was in some serious need of TLC. It looked like the light box panel had been through a hurricane as the front graphics were falling off. We knew just what to do! First thing’s first: we had to remove that sign before it scared away any more customers. We knew we were on a tight timeline because we did not want Tropical Smoothie to be without an exterior building sign for long. We took it back to our shop and removed all of the acrylic lettering inserts. The artwork we were given for the job did not match the sign that was on the storefront, so we had to rework the graphics file to make it match. Once we had the design down, we printed out and installed the new vinyl graphics and reset all of the existing acrylic lettering. The lightbox worked perfectly fine, so we saved that part and just installed the new graphics. This was an eco- and budget-friendly solution. Finally, we used our lift truck to reinstall the refurbished lightbox panel. In the end, the client was quite pleased with the job we did! We can refurbish your sign! Your markers are the first impression many people get of your organization. With sharp, vibrant graphics that accurately represent your brand and company culture, people will know exactly what you are about. On the other hand, if your signs are illegible due to fading, graffiti, or weather damage, shoppers may assume you are no longer open for business. Or, they simply may not trust you. 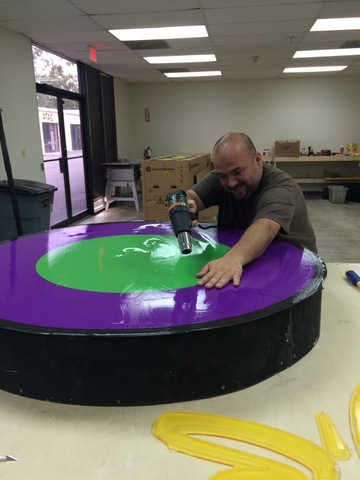 Fortunately, Citrus Sign Studio is a full service sign company that offers sign maintenance, repair, and refurbishing. Our friendly professionals will gladly come to your venue to perform regular maintenance, such as cleaning electrical components, so your markers will continue to look great for many years to come. If your signs are looking less than ideal and you need a signage facelift, contact us today for a free consultation.